In early 2012, Aditi was selected by a DUSP search committee to receive the SAGE Publications-supported SAGE/Marilyn Jacobs Gittell Activist PhD Fellowship. Her research interests include participatory planning, technology and civic engagement, community development, as well as issues around racial and ethnic diversity. During her first year, Aditi’s research will focus on a comparative analysis of community-based research methods across the Urban Research-Based Action Network (URBAN), (a platform that seeks to promote community-based research and engaged scholarship across the U.S.), providing CoLab and its partners with an early understanding of emerging patterns in the field. Adiit's research will complement the strategic development of URBAN. 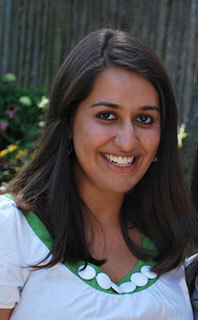 Since 2010, Aditi Mehta has been a strong partner and collaborator with CoLab. Her affiliation with the Lab began during her time as a graduate student when she launched the Who’s on Broad? storytelling project in New Orleans, Louisiana as a NOLA Fellow. Aditi went on to create a media portrait of Khirkee Village, India, in collaboration with some of its residents. Somewhere between New Orleans and India, Aditi also started collecting and publishing photos of discarded chairs on CoLab Radio. She found that chairs left on street corners brought personality to the street. Gradually others began collecting and publishing chair photos too. In October of 2011 CoLab mailed about 40 enlarged chair photos to cities around the globe for an International Street Chair Pop-Up Show. Chair photographers continue to flock to CoLab. This winter, she co-designed and co-taught the CoLab course People, Planning, and the Story. When Aditi graduated from MIT with her MCP she maintained a strong affiliation with CoLab and CoLab Radio while working full time for the Boston Foundation as a Research and Communications Associate on the Boston Indicators Project. Today we are fortunate to have Aditi back at MIT, innovating and pushing the boundaries of scholarship and community engagement in partnership with CoLab.